The latest NetEnt slot games are always good to explore, and the Divine Fortune slot is no exception. Here, we’re treated to a lesson in Greek mythology. Don’t worry, though – while Medusa can appear, she won’t turn you to stone. Instead, she may just bring you a stunning prize. 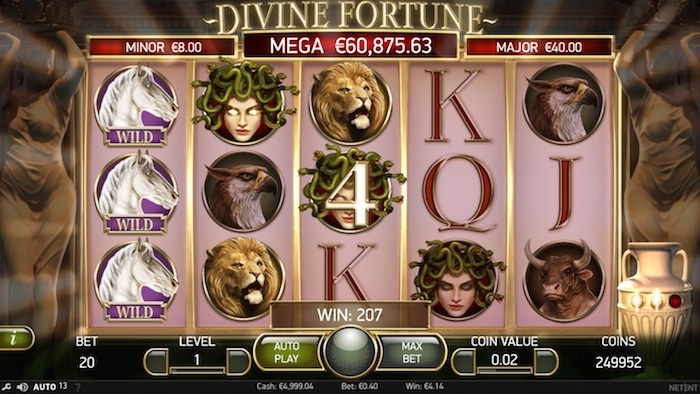 The Divine Fortune slot is a 5 x 3 online slot featuring 20 lines. It has an eerie feel about it, perhaps because Medusa and her snake hair appears on the reels. She has her eyes shut, thankfully, although to us that still feels ominous. A Greek statue appears on either side of the reels, so you are clearly in a temple here. There is also an ornate urn to the right of the reels, which looks like decoration but can mean so much more. NetEnt’s Divine Fortune also treats us to the promise of minor, major and mega jackpots. If you’re familiar with NetEnt games, you shouldn’t have any trouble using the controls here. The paylines are fixed, but you have several coin values to use and 10 bet levels available as well. Winning lines are indicated clearly and it’s nice to sit back and watch your progress. The graphics are impeccable as you would expect from NetEnt and we love the realistic images of the great greek mythological creatures. The NetEnt paytable is indicated, as usual, with the small ‘i’ to the left, by the statue’s legs. This has nine pages and reveals Medusa, a Minotaur, a lion and a phoenix as the larger payers. A (appearing as a triangle), K, Q and J are the lower-value payers. Pegasus, the white horse, is the wild, while the free spins symbol is a hand holding a lightning bolt – as you do. A golden coin is shown too, but we’ll come to that in a moment. Whenever a wild appears, the wild drops into the slot below and you get a Falling Wilds respin. This continues until the wild(s) drops off the reels, so you could get several respins with this feature. The Wild-on-Wild feature occurs if a wild symbol should fall behind a Falling Wild. This triggers the wild to expand over the whole reel. You then get the respin feature with two Falling Wilds involved to make things more interesting. Remember the free spins icon we mentioned? Three or more of those landing in any position means you can play some free spins. You get five free games for three icons, eight for four and 12 free games for five free spins symbols. All wilds appearing in the free spins feature will become Wild-on-Wilds, i.e. they will all expand to take over the respective reel(s). That means you should get additional chances to form winning combinations, which is as it should be for a free spins feature, we think. Now… remember that urn we mentioned in the introduction? It turns out this is the most important feature of all. That’s because something special awaits when you find three or more golden coins in the main game (not in the free spins). Each coin could be worth between 10x and 200x your bet level, and they are arranged on the reels before the Jackpot Bonus game begins. The coins are shown coming out of that urn, and it could mean it hides a significant prize for you. Did we say jackpot? We did, because you could win one of those three progressive jackpots in the game. You get three spins of a different set of reels to start. Any bonus symbol landing resets your spin count to three. If you manage to fill one row with coins, you win the minor jackpot. Two rows lead to the major jackpot, and three rows – you guessed it – will lead you to scoop the mega jackpot. And that could be worth a lot of money. So, you have a chance to win some significant prizes if you win through to the bonus feature, even without the progressive pots to aim for. Coin values go from 1p to 50p, and there are 10 bet levels available. That makes the smallest amount 20p for a spin, and the largest £100. Medusa can deliver a 600-coin prize for five on a payline. You also have a chance to win more if you do well in the free spins feature. And, of course, there are the progressive jackpots to consider too. The return-to-player offered by the Divine Fortune online slot game is 96.59%. We’ve written plenty of UK slot reviews before now, and the Divine Fortune slot has given us yet another pleasing game to look at. We liked the depth of it and the animation was good too. It’s always reassuring to find a slot that offers more than free spins as your bonus, and this one has several great features to look forward to. With animated characters that react when involved in a win, you’ll be brushing up on your Greek mythology and hoping the likes of Medusa and the Minotaur will be lucky for you. The Divine Fortune NetEnt slot is an experience you’ll want to enjoy.